1. Some Zones have paid over time for more hours for working on 12th and 13th November while rest have paid limiting it to 61/2 and 7 hours . 2. Under written or oral instructions of Head Office, recovery is made or attempted in some Zones where the payment is made more than 61/2 and 7 hours. 3. HO has not till date considered payment of over time for actual hours of work for all days including on 12th & 13th November, 2016. 5. Some banks are still silent (like our bank) about payment of over time for other days ( other than 12th and 13th November, 2016). 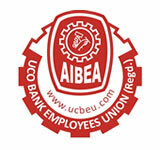 AIBEA HAS INCLUDED THIS DEMAND IN THE PRSENT AGITATIINAL PROGRAMMES OPPOSING BUNGLING OF THE GIVERNMENT AND RBI IN THE PROCESS OF DEMONETISATION. OUR FEDERATION TOO HAS CITED THE ISSUE IN THE SIGNATURE CAMPAIN PROGRAMME. We have once again written to Head Office, copy of which is enclosed here with, which is self explanatory . What units should do ? We are sending two attachments Annexure 1 and Annexure 2 for further action to be sent to branches. Where recovery is made or contemplated separate letter (Annexure 2) should be submitted to branch head with a copy to Zonal head and Unit head quarters. Meet Zonal / Circle head, serve copy of our letter to HO with a demand for their support and taking up with HO. With greetings and advance wishes for HAPPY & PROSPEROUS NEW YEAR - 2017 to all our comrades and their near and dear ones.